Gerber Outerwear utilizes a wide array of performance fabrics, reflective materials and subassemblies to enhance comfort and protection. We are constantly working with our suppliers to bring cutting edge technologies to every garment that we manufacture. StedAIR EMS Fabric is waterproof, breathable, windproof, bloodborn pathogen impervious and resistant to several hazardous compounds commonly encountered by rescue personnel. StedAIR EMS fabric has been independently certified to the NFPA 1999, 2008 edition as a protective barrier component. An added level of protection is its ability to withstand exposure to AFFF (aqueous fire fighting foam), unleaded gasoline, chlorine, battery acid and several other oil based solvents. This fabric provides extreme protection from the elements combined with a high moisture vapor transfer rate allowing the fabric to release hot humid air away from the wearer keeping them dry and comfortable. 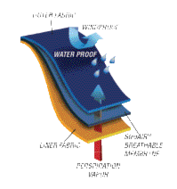 BioTex Barrier Fabric is waterproof, breathable, windproof, and blood born pathogeen resistant. It has been independently tested to the ASTM F 1671 Test Method for Resistance of Materials Used in Protective Clothing to Penetration by Blood Born Pathogens. This lightweight fabric provides an effective barrier against all types of inclement weather while still allowing hot humid air to escape. Despite its soft hand it is tough enough to stand up to rugges use. LumenX Fabric utilizes microscopic glass beads appied in a unique diamond plate pattern to a taslanized nylon base to create an accent material that appears a subdued navy during the daytime yet reflects bright white at night. The LumenX Accent Fabric is used on our jackets to provide the wearer with an added punch of visibility in a stylish modern garment. 3M Scotchlite Reflective Materials are recognized as the leading high performance retro-reflective component for worker visibility. The use of Scotchlite Reflective Materials provides increased peace of mind to people who wear safety garments. They know that their garment contains material that will enhance their visibility in low-light and nightime conditions. And they value that their reflective material comes form 3M, a trusted name known for quality and innovation. To build your custom 3 in 1 jacket system, select an Outer Shell and an Inner Liner that meets your specific job functions and weather conditions and you are ready to go. Thanks to this standardized system, you can also add additional pieces to meet new demands at any time in the future. YKK Zippers and specialty closures are the little parts that make a big difference. With their unsurpassed quality and rugged construction, YKK's zippers can withstand years of use without failure. Ykk's vertically integrated manufacturing process guarantees that every sub assembly is produced to the highest standards. This consistency can be seen and felt in the smooth action in their zippers or the reassuringly firm hold from any of their other specialty closures.